In addition to directly supporting preschool children in the classroom, Jumpstart also engages a variety of community members as volunteers who contribute their time and talent to enhance Jumpstart’s service to our partner early childhood centers and the community at large. Jumpstart is a national early education organization working toward the day every child in America enters kindergarten prepared to succeed. We provide language, literacy, and social-emotional programming for preschool children from under-resourced communities and promote quality early learning for all children. Join us to work toward the day every child in America enters kindergarten prepared to succeed. Learn more at www.jstart.org. The volunteer coordinator recruits, assists in training, and manages volunteers for various Jumpstart service projects that address specific program and community needs. The volunteers recruited, oriented, and trained by the volunteer coordinator consist of a combination of college students, local community service organizations, and others who can participate in a range of volunteer service projects. Volunteer service project categories include one-day, short-term, and long-term service projects. Recruit volunteers for one-day, short-term, and/or long-term service projects. This includes events such as Jumpstart’s annual Read for the Record, MLK Day Jr. Day of Service, and Jumpstart for a Day. Recruitment may occur through in-person conversations, posting to social media, holding recruitment events, etc. Present Jumpstart’s mission and service opportunities to campus and local community organizations, student groups, faculty, and staff to recruit volunteers. Coordinate all volunteer required criminal history checks for participation in a volunteer event. Collaborate on preparation of service project materials. Co-facilitate and support training of volunteers on topics such as reading to young children, assembling literacy materials, and filling out volunteer paperwork. Assist site staff in identifying volunteer service projects through needs assessment and ongoing communication with partner early childhood centers. Assist site staff in implementation of service projects and support volunteers for service projects held at partner early childhood centers. Assist site staff in implementation of events related to Jumpstart’s Read for the Record. Work with site staff and Jumpstart members to plan on-going and/or annual volunteer appreciation events. Solicit in-kind donations to support service projects according to AmeriCorps guidelines. 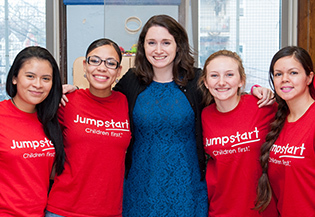 Work with Jumpstart site staff to manage volunteers from Jumpstart’s corporate partners. Establish and regularly update volunteer schedules and list of events. Communicate and engage regularly with volunteers through check-in phone calls, e-mails, and personal appreciation for their efforts. Work with Jumpstart site staff to ensure volunteer criminal history check requirements are fulfilled and all required paperwork is collected and organized appropriately. Document and log volunteer hours in volunteer tracking tool and report hours to Jumpstart. Collect, manage, and compile feedback from all parties involved in volunteer service projects, including volunteers, partnering early childhood center staff, and community members through written reports, testimonials, and verbal comments. Research relevant community organizations to coordinate additional volunteer opportunities for Jumpstart members. Experience with Microsoft Office programs – Word, Excel, PowerPoint, and Outlook. Jumpstart is an equal opportunity organization and encourages applications from all individuals without regard to race, color, religion, gender, sexual orientation, national origin, age, disability, marital status, amnesty, political affiliation, or status as a covered veteran in accordance with all applicable federal, state and local laws. Qualified individuals with disabilities are strongly encouraged to apply. Jumpstart will make reasonable accommodations for qualified individuals throughout the application process and during Jumpstart service. Accommodation requests should be directed to the Jumpstart office to which you are applying. Jumpstart is a proud member of the AmeriCorps national service network. Please note that not all Jumpstart sites are directly supported by AmeriCorps.